Today I’m over at Nutta with her Sew Japanese series. Shino’s really delving into a few specific designers so there’ll be a lot of great info this week and I urge you to check it out. She asked us each a few questions as part of the series and you can read my interview here. A while ago I won this book (*affiliate links) in a giveaway from the Japanese sewing series run by You and Mie and I was so inspired by the series that I couldn’t wait to get it and start sewing. Then it arrived, and was put to the back burner in favor of quicker projects. Since I had never sewn with a foreign language pattern before, nor do I know ANY Japanese, I was hesitant to start what I was worried would be a long project. Then my friend Shino asked if I wanted to participate in a series on her blog where she goes a little more in depth into the styles of different designers and decided it was high time I use that book. Luckily Kids Clothes Sewing Lesson was on her list of books that she wanted to review. I had been eyeing this simple dress with a bow back closure for awhile so I decided to start there. You can read a little more about how I fared with this first non-translated Japanese pattern on my post at Nutta, but first let me tell you a little more about the fun fabric I used. It’s an organic jersey knit from Kitschy Coo – which you know I love – and the pattern is based on a German fairy tale called the Stern Talers (Star Monies). The gist of the tale is a little orphan girl gives away all of her meager possessions to those who she feels need them more. 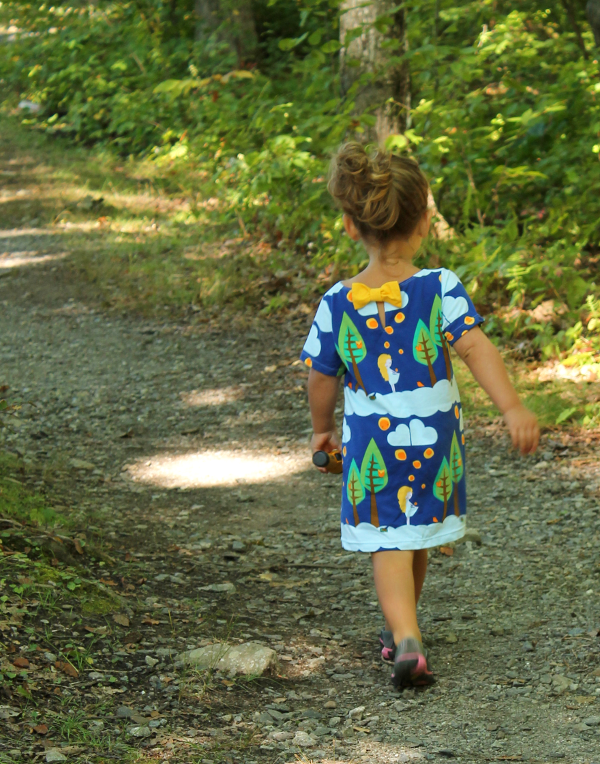 Then she is walking in the woods one evening wearing the only thing she has left which is a worn out dress, when she encounters another child who is naked. She gives the naked child her own dress and suddenly stars begin falling from the sky around her and they turn into talers which was a form of money. She finds she is also wearing a new dress of the finest linen and is richer than she could have imagined. Some of Grimm’s Fairy Tales can be a bit frightening, but I enjoy this one. 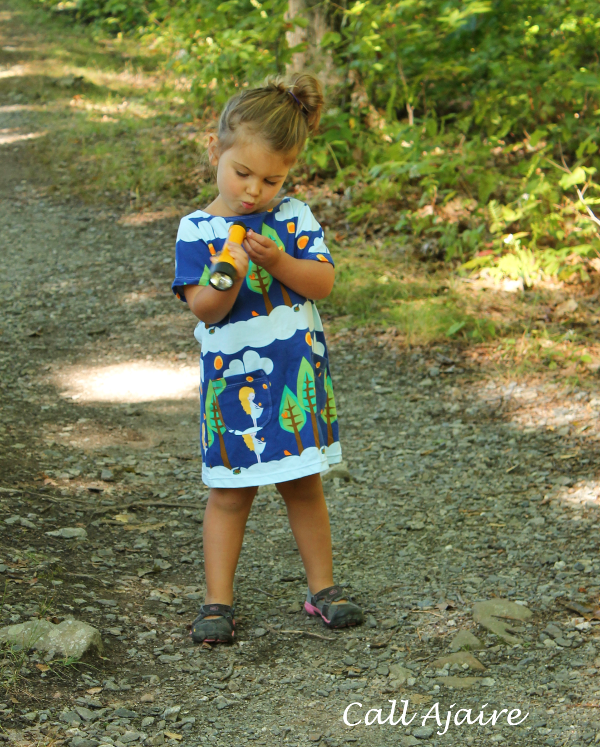 I think the sweetness of this print fits perfectly with the shape of this dress pattern. It looks like Amanda has run out of this Stern Talers print, but she has a coordinating print with just the stars and if you ask her really nicely she may be able to restock this one. So with a foreign fabric, new to me fairy tale, and a pattern written in Japanese, this dress was a fun adventure. Thank you to Shino for having me in this series and look forward to more Japanese sewing patterns on this blog in the future! The fabric is perfect for that story. 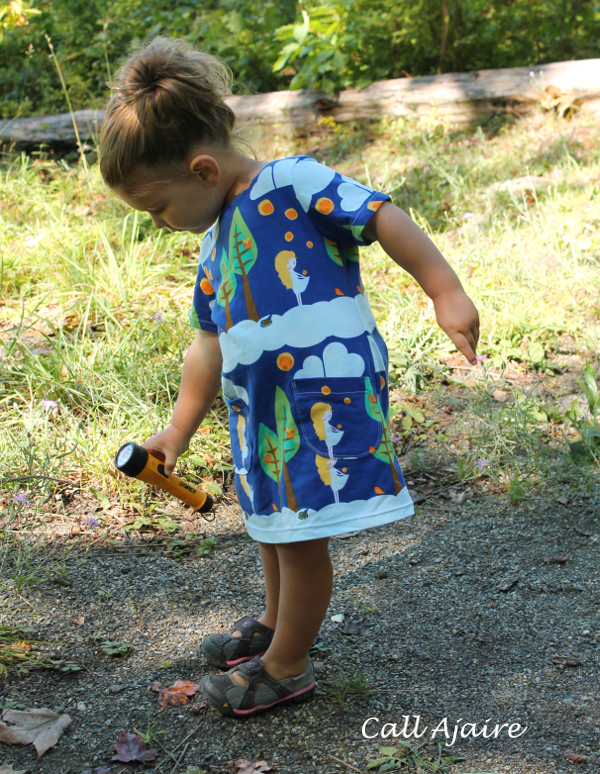 I love her curiosity with that flashlight. And, as always, the view of her hair up as she walks away. She loved that flashlight. And shining it into her eye…. That is so funny Amy! Me too and I never even realized it. There's another dress in the book that I've seen made a bunch that I'm in love with too. It's the flutter sleeve one and I think you'd really like it! Month long is perfect! Especially for my super crazy schedule! Oh I'm excited to see where this is going. I like the new format! Thanks so much for joining my series! I'm glad I could push you into Japanese pattern world 🙂 And this fabric (and that story) is so cute. Ow, I'm still sooo in love with your Alleycat romper! 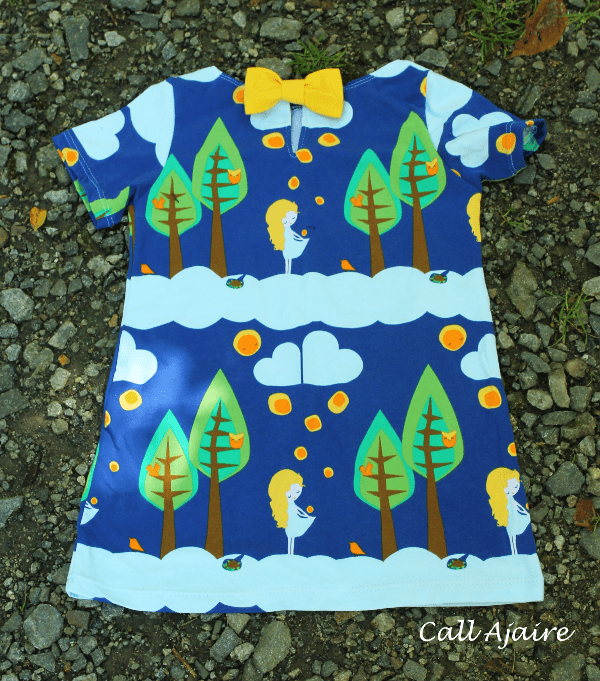 And the mashup is cute as well of course, but I can't stop swooning about your romper…. Month is great, I'm swamped in projects myself, but love to follow! You're right -that back neckline is amazing.